My goal in writing this series is simple – to help that legendary fish, the Big Kinosoo who lives deep in the waters of Cold Lake, Alberta, to grow in stature. While our very own Kinosoo has not yet reached the mythical proportions of the Lock Ness Monster of the Scottish Highlands, Ogopogo of Okanagan fame, or that famous bushman of the Pacific Northwest, the Sasquatch, working together we can change things for the Kinosoo. While anecdotes abound, they are necessary but not sufficient for that fish to reach iconic status. Like the other Great One of Alberta, we want people to become hushed and bow down whenever they hear the name Big Kinosoo. To do this we must search out new stories, stories that include scientific fact which points toward existence of historic big fish. It would also help have a government or military cover-up, perhaps one that could turned into a full-blown conspiracy. Conspiracies are, after all, nothing more than a few solid facts mixed with a lot of fiction. While our Kinosoo might never become as big as the cover-ups carried out in Area 51 that abuts the Edwards Air Force in Nevada, with new information recently secured from Guy Venne, a man who grew up in Cold Lake, we can make a good start. To ensure our Great One of is given his fair due, we must blend fact and fiction into a credible story just as the other Great One has done. When I first began writing the series, I had fun tracing important parts of the history of Cold Lake over the last two centuries. As for the Big Kinosoo, I found bits of information in books and articles that included the words of people I knew when growing up in the wilderness areas north of Cold Lake in the 1940’s. 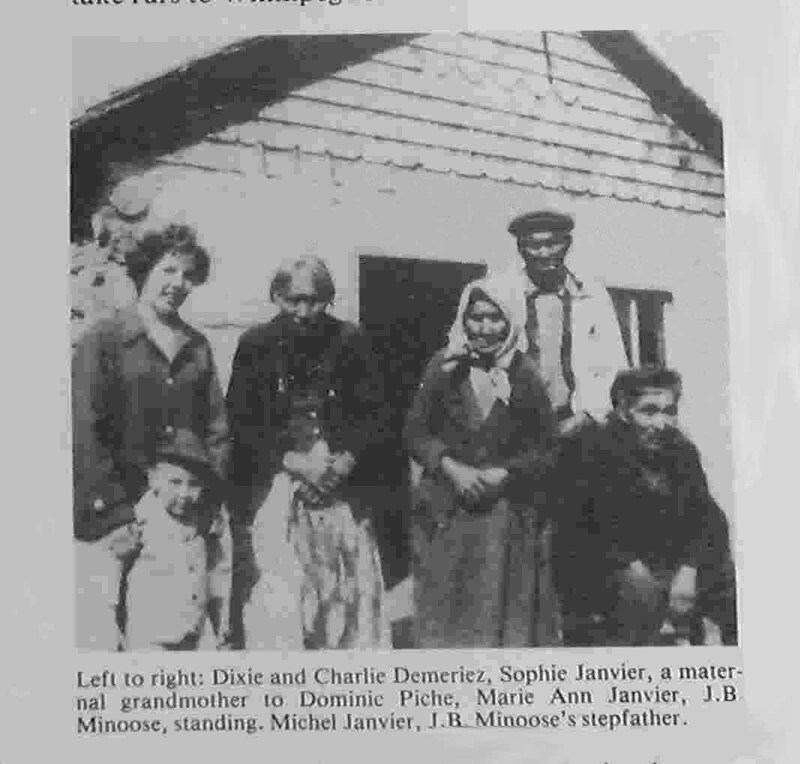 One of those people, J.B Minoose, (Photo, standing right) a Cree Native, lived near English Bay, an area not far from three of our homes of the mid-forites (Martineau River Camp, North Bay and Marie Lake). Mr. Minoose told all manner of stories about the history of his people in Cold Lake with one of those stories appearing in a book titled Treasured Scales of the Kinosoo. In that story Mr. Minoose referred to the Big Kinosoo by its Indian name – Kinachuk. (Link to Kinachuk Story). The stories told by Mr. Minoose were his way of preserving the history of his people, the people who first settled Cold Lake in the 1800’s, perhaps earlier. Mom and Dad also told many stories and while Mom’s stories were about the gypsy life of our family, Dad’s leaned toward the less factual – in other words he was an excellent bullshiter. This is not meant in a negative way, it is just that Dad could string together really good tales that played fast and loose with the details. His stories were as much a part of our family history as the more factual ones told by mom. Both were great storytellers in their own way, but with Dad you had to use a little caution when applying the believability scale. Of course, I like both styles and make free use of those styles on this blog. Since writing the first six parts of the Kinosoo series in 2010, I have continued to trace reports of that big fish and while most reports were anecdotal, I recently learned new details concerning the crash of a DHC-3 Otter in the early 1960’s. The information came from a school friend, Guy Venne,when he and his wife Donna were visited Victoria in July 2014. Guy’s photos led me to write the Cold Lake High School Series (Link to Cold Lake High). Guy was one of the few among us who always had a camera at hand and to his lasting credit he preserved hundreds of those photos. After graduation Guy and I worked for a few years as Crash Rescue Firemen with the United States Air Force Strategic Air Command when the US had a KC97 tanker refuelling base at Cold Lake. It was during recent visit when copying more of his photos for the Fire Walkers and Hight School Series, that I came across three photos of that downed DHC-3 Otter. I had no idea any existed. Photo (Guy Venne Files): Photo taken in the fall of 1961 at Camp Borden (Link to Fire Walkers for names of crew) (double click twice to get full sized photo). 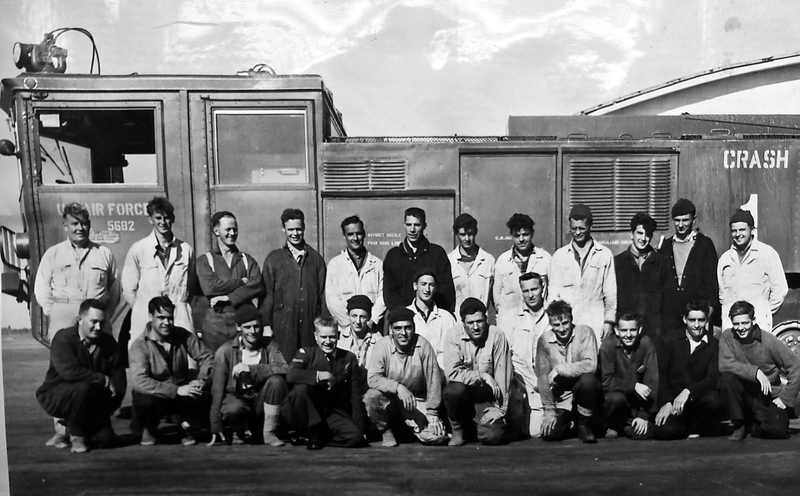 I further learned that Guy, a first responder with the Cold Lake Volunteer Fire Department (late 1950’s to early ’60’s), was actually at the Otter crash scene and had taken a number of photos. Unfortunately, the RCAF Investigators seized his film roll as part of their crash investigation. Those photos were later classified as secret and never again seen. Bingo, I immediately knew we had our conspiracy theory. It was just fortunate that Guy had three other photos that he held to this day. I was now convinced the Big Kinosoo story could move beyond pure anecdote and into the world of reality. Guy’s clear memories, as well as those photos of that long-ago crash, is now included in Part 4 of the Kinosoo series (link here). Inspired by this find, I have continued a wider search for any scientific literature supporting the Great One as being more than just a legend, as, in fact, a living monster fish which lurks in the depths of Cold Lake. Bathymetric charts prepared by the RCAF in the late 1950’s as they prepared their low level flight routes, reveal the topography of Cold Lake exhibits all the markers of being a meteoric impact crater. While the lake now includes a number of bays and shallow areas, these have clearly been formed over the centuries as a result of erosion that brought in sediment from a water catchment area that covers more than 24,000 square miles (15,360,000 acres) an area roughly the size of the Republic of Ireland. Even with that sediment pouring in, the lake remains roughly circular with a radius varying between five and six miles (25,000 feet) and the deepest body of water in Alberta. Over the past fifty years Seismic surveys conducted by the major oil companies mapping oil sand deposits in a vast area that stretch from Cold Lake to Fort McMurray, reveal the original bottom of the lake to be conical shaped and something in the order of 2000 feet at the concentric centre. Google Earth Screenshot: The circular overlay approximates the area of the meteor strike. 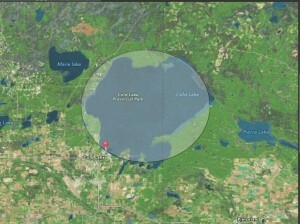 Compare this to a meteor crater located 50 miles south of Bend, Oregon (photo in footer). The one near Bend, created about 15,000 BCE, created an impact hole with a diameter of 5,000 feet and current depth of 425 feet. 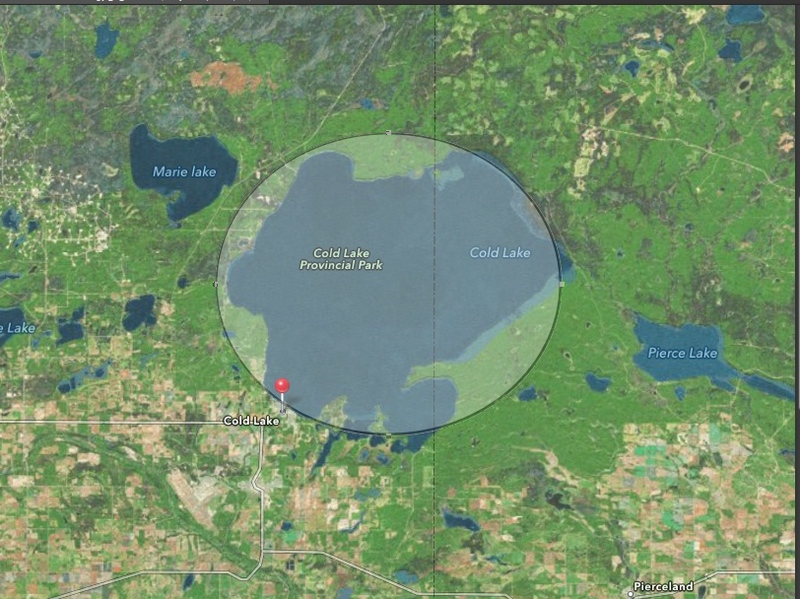 The crater at Cold Lake was roughly ten times as large, but as the one at Cold Lake was created hundreds of millions of years earlier, readily visible surface signs have been erased. Of the Top 10 prehistoric fish known to exist today, the Sturgeon is likely the best known in Canada. Photos of a few of these fish were included in Part 2 of this series (Link to Monster Fish of Canada). Others you may have heard of include the ferocious Alligator Gar and, of course, the most famous that was one time thought to be extinct, the Coelacanth. This no doubt these fish and other giants found a protective shield in sheltered waters and aquifers during the Jurassic Period, conditions which existed at Cold Lake all those millions of years ago when the oil deposits were being formed. It also seems likely the Big Kinosoo was just another of those fish that have yet to be discovered. The fact that scientists have recently discovered giant pools of water existing well below the earths crust, leads to speculation that pre-historic fish could migrate between bodies of water contained far below the earths surface. While much of this is speculative, it is clear the body of scientific knowledge is rapidly increasing. Part 4, Otter Down in French Bay: The original post has now been updated with information from Guy Venne. Catchment area: 24,000 sqare miles. General information about the Cold Lake area. “While on the topic of craters being present on the surface of the Earth, we came across much information about these craters as well. 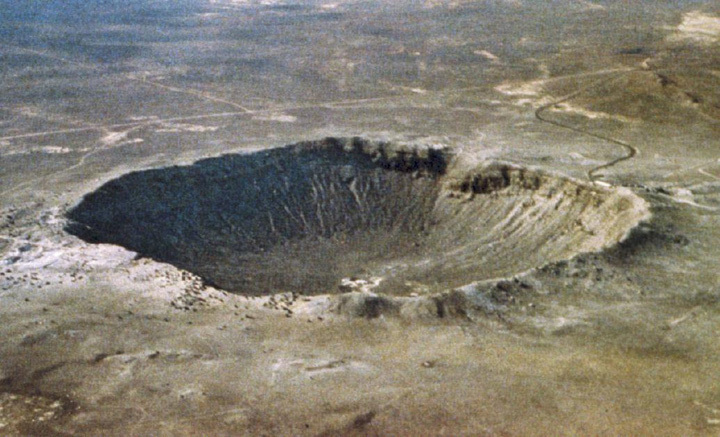 There have been 160 craters found on the earth’s surface and more are found every single year. When meteors were thought to have hit the earth thousands of years ago they altered the climate, disturbed evolutionary life, and more or less sterilized the earth’s surface. The most recent evidence of the mass extinction as a result of these impacts was the extinction of dinosaurs 65 million years ago. One well-known crater is Meteor Crater located in Arizona. This crater has a diameter of 4,000 feet and is 600 feet deep. The area surrounding the crater is littered with debris ejected out of the crater creating hummocks. Hummocks are simply piles of debris ejected from the impact site into the surrounding area. Meteor Crater was formed by a meteor, but scientists cannot find the meteor that caused this depression. Meteor Crater is named as such due to the fact that it was the first recognized crater formed from a terrestrial object. Photo (Web Source) This giant sturgeon, linking back to pre-historic times, may well be a distant cousin of the much larger Big Kinosoo. It bothers me to see the life extinguished from this beautiful fish. For millions of years the species have survived topical storms, ice ages, volcanoes and meteor strikes and thousand other challenges over two million years, yet, it seem’s man in a few hundred years may be the overwhelming challenge that brings the species to an end. I don’t suppose these men would be smiling if they took a moment to think about the long battle that fish fought to help keep the species alive. 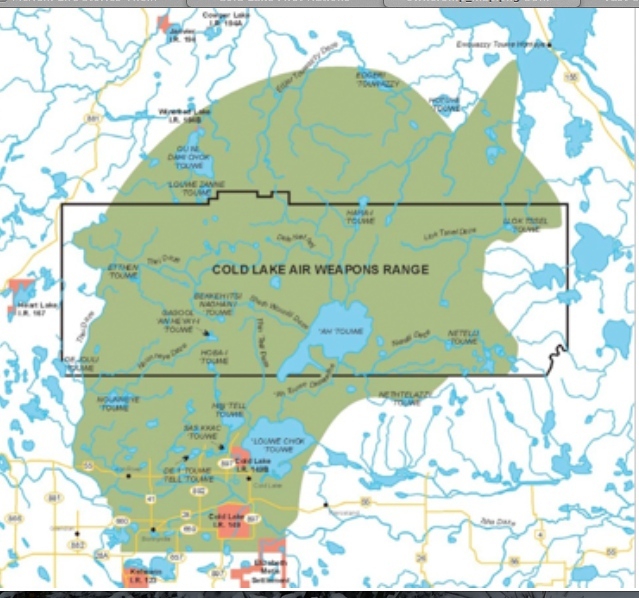 Map (Web Source) A portion of the Cold Lake Water Catchment area. The area is largely flatland with hundreds of small lakes, rivers and streams. 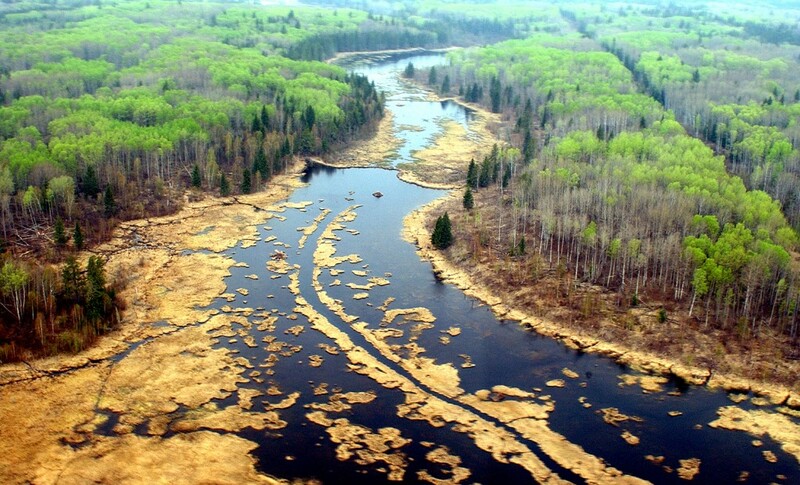 The Martineau and Medley Rivers are the main inflows from the North, and the Cold River the main outflow in the Southeast Corner (in Saskatchewan).